The Rays need stars. It’s all well and good to come up with a bunch of league-average plugins, but without stars, a team is stuck. A team is trapped, being okay without being good, and there’s a reason people are beginning to wonder whether the Rays should tear it all down. Without enough stars, what chance do they have of getting over the top? What chance do they have of keeping up with the Red Sox and Yankees? There’s a certain amount of appeal in pressing the reset button. And no one could blame the Rays, given the reality of their circumstances. I’m not sure if the Rays will throw in the towel. They understand the process better than most, and they’re forever thinking about the longer-term, but conceding the present is never easy. It’s a major decision that asks an awful lot of the roster and the fan base. So maybe the Rays will blow it up, or maybe the Rays will tinker. Should they opt to keep trying, that could reflect organizational confidence in the development of Blake Snell. Snell isn’t a star, not yet. But he could become one. He might’ve gotten much of the way there over the season’s final two months or so, when the Rays were mostly tuned out. Snell turned around an ugly season, and the biggest change happened around July 24, from which point forward the Rays went 29-34. The team took on water, while Snell built on his potential. Snell could now profile as one of the best players on the club. Through July 23, Snell had made 11 starts, running a 4.98 ERA with lousy peripherals. From July 24 on, Snell made 13 starts, running a 3.31 ERA with far better other numbers. Snell’s second half was much better than his first, and Baseball Savant supports that it was well earned. 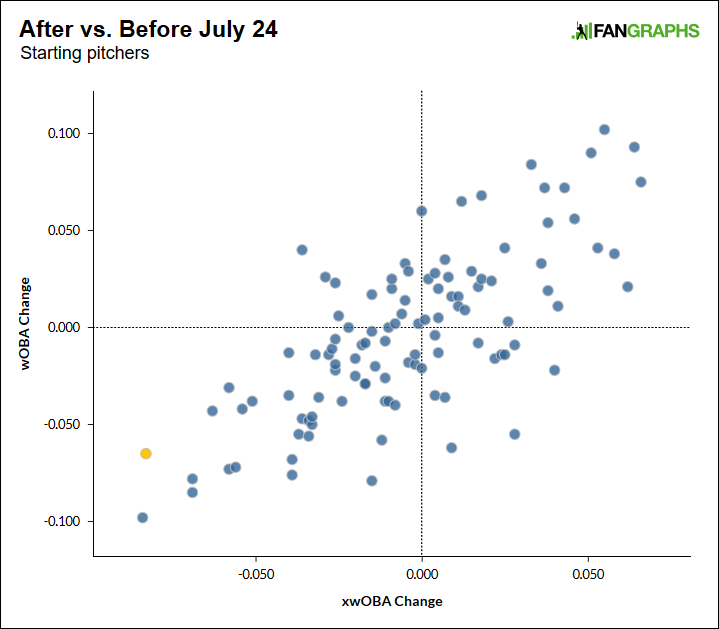 The following is a plot of changes in both wOBA allowed and expected wOBA allowed, for starting pitchers, before and after July 24. Snell’s point is highlighted in yellow. Out of the data pool, Snell showed the second-best improvement in expected wOBA, dropping from his earlier figure by 83 points. That left him 14 points clear of the pitcher in third place. The only pitcher in front of Snell was Justin Verlander, who dropped from his earlier expected wOBA figure by 84 points. That’s all of a one-point difference. Verlander’s turnaround didn’t go unnoticed, as he fought to return to his previous level of talent. For Snell, this would look more like emergence. Through July 23, his expected wOBA ranked in the bottom fourth. After July 24, it ranked in the upper tenth. Over Snell’s final 13 starts, he was one of the best starters around. Why did I choose such a specific date? It’s not just a matter of convenience to prove the point. 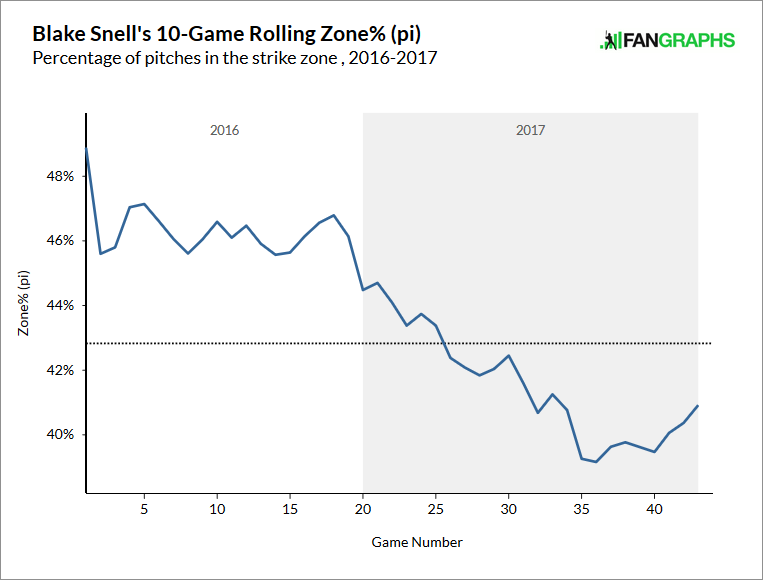 Rather, between consecutive starts, Snell made a change. Some might call it subtle, and others might call it significant. But Snell changed his positioning on the rubber, moving from the extreme third-base side to the middle. Snell is far from the first pitcher to alter his alignment, but the results would suggest the adjustment agreed with him. There’s a little more to it than that. It’s always hard to figure out how and where to assign the most credit. 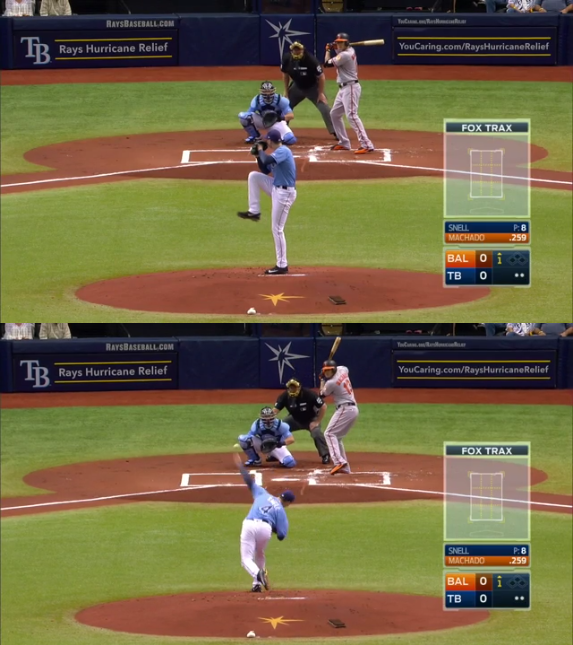 Below, two pairs of screenshots, one pair from a very early start, and the other pair from Snell’s last start. The different positioning on the mound is unmistakable. Snell also seems to have further raised his leg at the balance point. And then I’m drawn to what I see in the second image of each pair. Earlier on, Snell was throwing a little more across his body. Later, he became more direct to home plate, and I wonder if this was deliberate, or a natural consequence of moving over on the rubber. 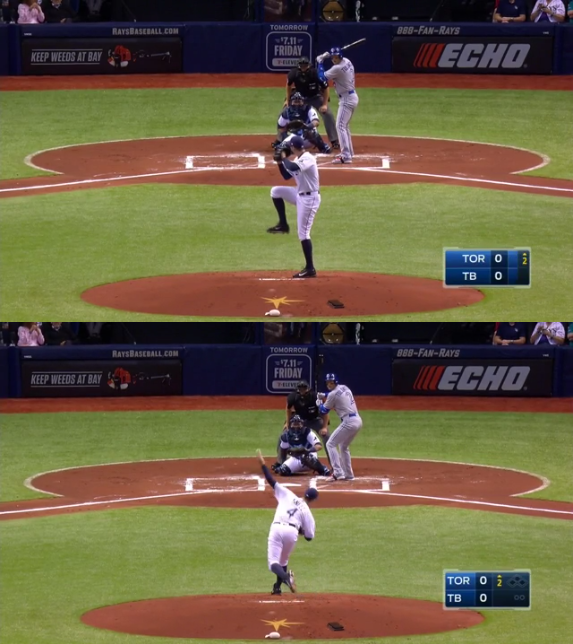 No longer standing on the third-base side, Snell couldn’t close himself off so much with his landing foot. He opened up a little more, and that might’ve been just the trick for his control. Suddenly, Snell stopped getting into so much walk trouble. Compared to earlier on, Snell cut his walk rate very literally in half. As that happened, he got a little boost in strikeouts as well. And one of the interesting things about this is that it’s not like Snell just started peppering the zone. Instead, he was actually throwing more attractive non-strikes. The way batters responded to Snell, they wanted to be more aggressive, even though Snell was still largely staying out of the zone. That happens when a pitcher is deceptive, and when he’s throwing quality balls. 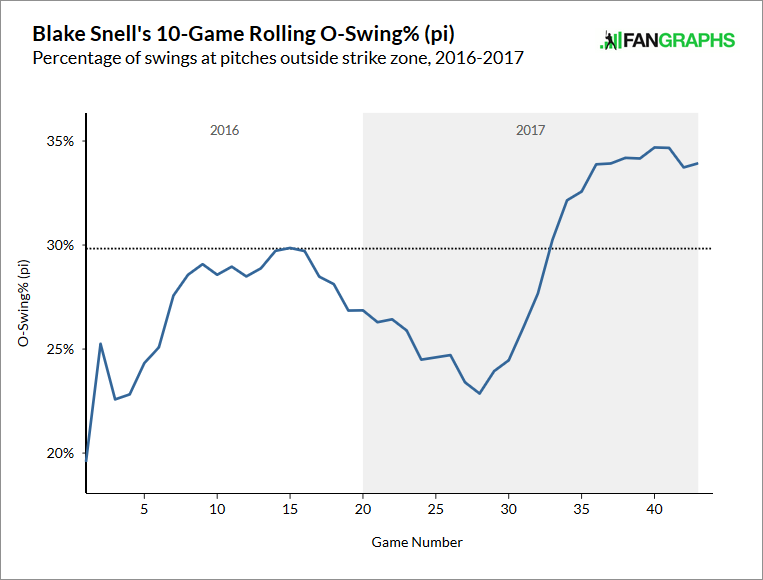 Snell’s general, overall strike rate improved from unplayable to good enough, and even the worse version of Snell was difficult to hit. As he got better, he alternated between weak contact and no contact. No longer so wild, Snell worked as a power lefty with four pitches. There was more going on than just a positioning change. Even if said positioning change led to the landing-foot change. As Marc Topkin wrote three months ago, teammates perceived that Snell became more dedicated to his workouts. He showed a greater focus and was simply more mature. It’s possible it all just clicked around the same time. And it’s worth pointing out as well that there were differences even within Snell’s own repertoire. 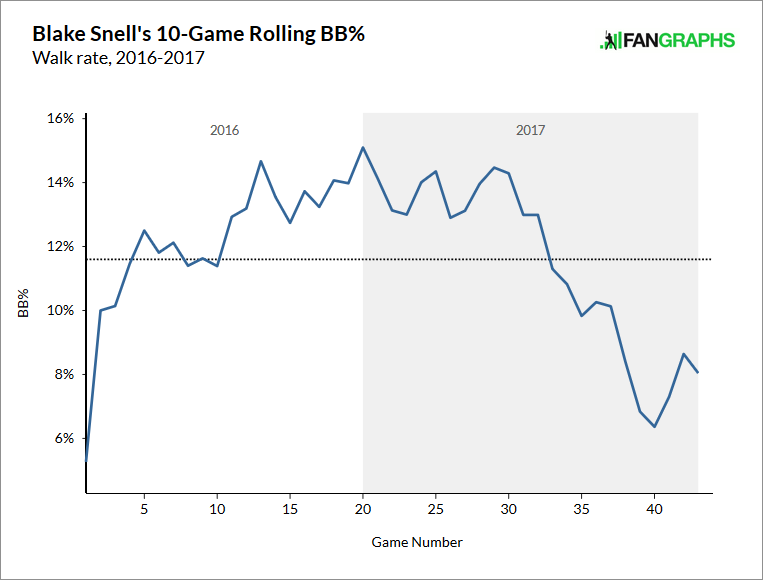 From July 24 on, Snell reduced his fastball rate about seven percentage points. Where, through July 23, Snell generated one strikeout with his curveball, after that he generated 29. Snell was using his pitches differently. And even the pitches themselves were different. Down the stretch, Snell’s average fastball gained a tick. His changeup and slider each gained two ticks. His curveball gained three ticks. This might’ve come out of Snell achieving better mechanical alignment. It’s more efficient to step straight toward the target. Alternatively, maybe this is a result of Snell working out with more of a purpose, although that would be a dramatic and sudden change. I’m guessing it’s more about the mechanics, and, to a lesser extent, just pitching with a higher level of confidence. Earlier in the season, Blake Snell had every reason to be miserable. He was pitching in the majors, but he was pitching poorly, and he couldn’t throw consistent strikes. His performance was nowhere close to matching his raw stuff. Adjustments were made — isn’t that always the story — and from the looks of things, the inner Blake Snell, the real Blake Snell, might’ve been unlocked. Snell looked like a major-league starter. For some stretches, he even looked like a major-league ace. Major-league aces are proven. Snell still isn’t, and so the Rays can’t be totally sure what it is they have on their hands. Snell might begin 2018 by taking two steps backward. His trajectory, however, is encouraging. The Rays need stars. Blake Snell isn’t one yet. He might have the best chance of being the next one to emerge. Snell has always had an arm to dream on, but the dreams now don’t seem so far-fetched. We hoped you liked reading The Other Major Second-Half Turnaround by Jeff Sullivan!